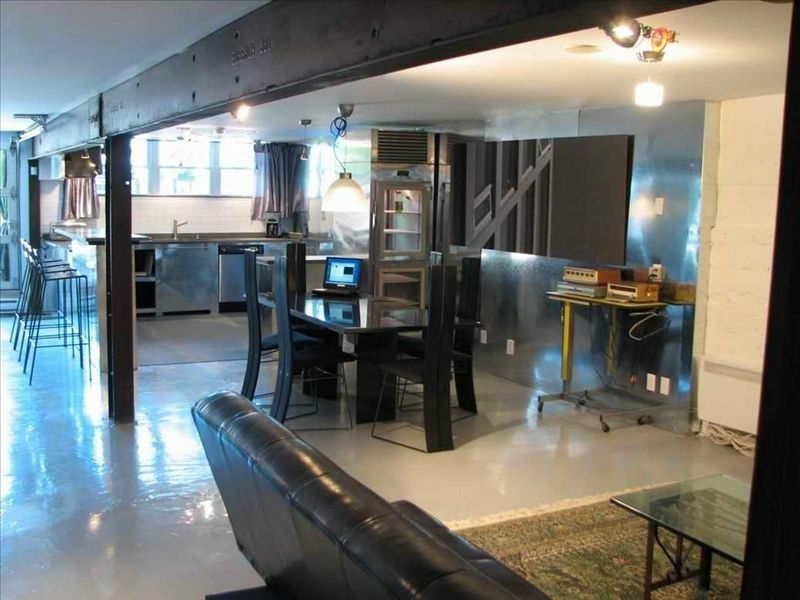 This loft truly encapsulates Montreal city living at its best. Fee deposit required for any kind of reservation 25 year old or holder require for the rental. Not recommended for families and young children. Jardin de style anglais (150 pc) entourer d’une barrière en bois privés avec parasol et ameublement de ciment . EVENEMENT SPACIAL Bachelor/ette 100$ nettoyage applicable sur tout reservation . Great place for large groups. The location is excellent, the owner is great, and having all the games was a lot of fun. The only downsides are the lack of parking and the beds were not very comfortable. For a group of guys or a group of kids, this is an excellent spot. We also enjoyed the green-way directly behind the property. If you have a large group and don't mind triple-bunks, this is a great spot. Group of friends enjoyed our stay, Stephan was a gracious and accommodating host. Quick Uber’s to all of the great attractions in Montreal. Hands down perfect bachelor party spot! You can stop looking for rentals, this loft is the best and only place you want to stay at for your bachelor party!! Stef, the owner is extrmely accommodating and is only a text away if you need anything. He knows you’re here to party and wants you to have a great time!!! The loft has everything you need for a bachelor party. Air hockey, foosball, pool table, plenty of couches. The best part about the loft isn’t pictured, but there is a huge garage door that opens at the front which makes a loft feel like an open air patio, loved it!! There was absolutely no problem with noise and we were not holding back!! Excellent location an easy cab to downtown. All members of my party were thanking me the whole time for booking this place as it was the best bachelor they had been to. Booking the loft is very inexpensive, and the money you save booking another place, you will loose in spending money to entertain yourself instead of having all the games you need at the loft. This place is so much better than booking multiple hotel rooms in which you would only see you buddies at dinner, when you leave your room, etc. Thank you so much Stef it was the trip of a lifetime!!! If planning a bachelor party...BOOK this quick! If you're looking for the perfect bachelor spot, this is it. The floor plan of the loft (fit my crew of 10 easily) is really spacious for partying. The sections of the loft all fit together for one big space so no one is left out of the action. There's a pool table, racing arcade game, foosball, and other arcade games to add to the variety of your stay. The private outside patio is blocked off from the street for great outdoor lounging. There are a ton of chairs and couches to lounge on which makes this place feel it can hold a lot more. If you're looking for a bachelor spot, this is the guy to rent from. He's very accommodating and wants you to use his place to fulfill your bachelor party dreams and desires. Everything is fully stocked so you don't need to buy toiletry supplies, dishes, cups, or towels. Take the time to talk to him or meet him upon arrival as you will not regret it. The location of this place is awesome. It is a short 10 minute taxi/uber ride into downtown. There are also very many liquor/convenience stores a block or two away. Restaurants/local eateries are plentiful and are 2 to 3 blocks away. McDonalds is a short 3 blocks away. We constantly walked back and forth for beer and food runs. There is a park across the street which gives this location a nice touch. This also means less neighbors. We never received a complaint from the neighbors and we really never toned it down. Have as much fun as you want noise wise! Book this place while it's still available. I know what you're thinking. You probably want something closer to town or in an upscale neighborhood. I'll tell you right now, bachelor parties are won with floor plan, the owner, neighbors, noise level, and easy short walking access to alcohol and plentiful food choices. This bachelor spot will really make your dream of the most awesome bachelor party come true! you have to be 25 year old or older to rent this loft ,this is a travelers loft only . cleaning fee can may apply at the discretion of the property owner .